The Global Volcanism Program has no Weekly Reports available for Clark. The Global Volcanism Program has no synonyms or subfeatures listed for Clark. Clark submarine volcano lies near the southern end of the Southern Kermadec arc. This basaltic and dacitic stratovolcano consists of a basal substrate of massive lava flows, pillow lavas, and pillow tubes overlain by volcaniclastic sediments. Craters occupy the complex crest of the volcano. 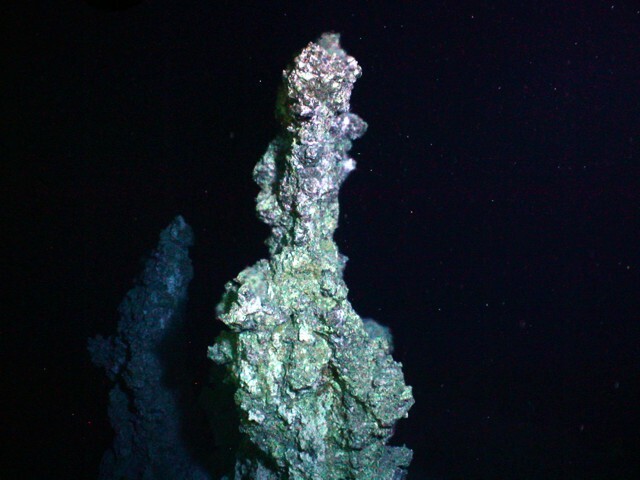 Clark is the southernmost volcano of the submarine chain that displays hydrothermal activity. Diffuse hydrothermal venting and sulfide chimneys were observed near the summit of Clark volcano during a New Zealand-American NOAA Vents Program expedition in 2006. The Global Volcanism Program is not aware of any Holocene eruptions from Clark. If this volcano has had large eruptions (VEI >= 4) prior to 10,000 years ago, information might be found on the Clark page in the LaMEVE (Large Magnitude Explosive Volcanic Eruptions) database, a part of the Volcano Global Risk Identification and Analysis Project (VOGRIPA). There is no Deformation History data available for Clark. There is no Emissions History data available for Clark. Clark submarine volcano is viewed here from the southeast looking northwest. The summit is featured, where one submersible dive took place a New Zealand-American NOAA Vents Program expedition. The approximate dive area is indicated by the white circle on the image. Depths range from 860 to 2585 meters. The resolution of the bathymetry data is 25 meters. The image is two times vertically exaggerated. The bathymetry data are courtesy of New Zealand National Institute of Water and Atmospheric Research (NIWA). Diffuse hydrothermal venting and sulfide chimneys were observed near the summit of Clark volcano during a New Zealand-American NOAA Vents Program expedition in 2006. Hot water (221° C, 430° F) was sampled at the base of this sulfide chimney, which is almost 6 meters high. 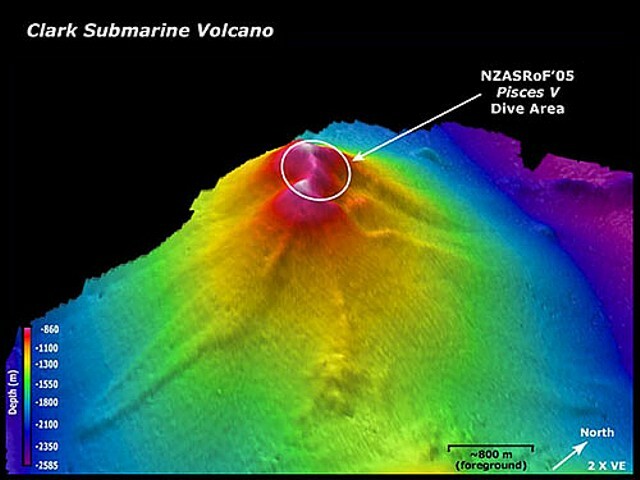 Clark submarine volcano lies near the lower end of the Southern Kermadec arc and is the southernmost volcano of the submarine chain that displays hydrothermal activity. There are no samples for Clark in the Smithsonian's NMNH Department of Mineral Sciences Rock and Ore collection. IRIS seismic stations/networks Incorporated Research Institutions for Seismology (IRIS) Data Services map showing the location of seismic stations from all available networks (permanent or temporary) within a radius of 0.18° (about 20 km at mid-latitudes) from the given location of Clark. Users can customize a variety of filters and options in the left panel. Note that if there are no stations are known the map will default to show the entire world with a "No data matched request" error notice. Large Eruptions of Clark Information about large Quaternary eruptions (VEI >= 4) is cataloged in the Large Magnitude Explosive Volcanic Eruptions (LaMEVE) database of the Volcano Global Risk Identification and Analysis Project (VOGRIPA).